Further tales from the Emerald Dream server. After getting creamed by massed kobolds going after Goldtooth in the Fargodeep mine, thanks largely to a huge aggro radius, and thus clearly not ready for exploring the next location, the Jasperlode mine, I figured it might be time for some parallel quest experience. So I packed up my Kobold Mining Shovel, hoofed it up Stormwind (only 32 more levels until I can buy a mount!) and took the Deeprun Tram over to Ironforge. My plan was to head down to Kharanos and the Thunderbrew Distillery for a set of quests that are in about the same level range as those in Goldshire. I was hoping to boost myself up a couple of levels in the hope that I could then survive kobolds coming at me in groups of three. So it was into the snow. Snow… why did it have to be snow? 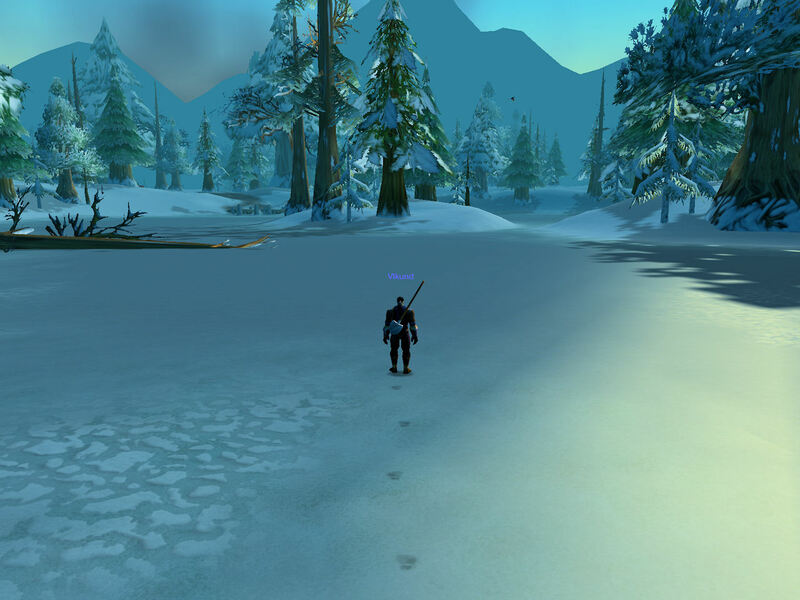 One of the reasons I stopped playing WoW the first time around… back in ealy 2005… was the dwarf starter area. But now… now Kharanos and its surrounding areas are like old friends. It used to be my pattern back in the old days to run both the Elwyn Forest and Karanos quests. So it was actually nice to be back amongst the happy faces at the Thunderbrew Distillery. So I ran around looking for a few quests. I am not sure I can really express how incredibly weird it is not to see quest givers on the mini map. Little question marks and exclamation points on the mini map have been around for so long that it practically causes my brain to rebel against what my eyes are telling it when my character is standing and looking at an NPC with a quest but the mini map is blank. Fortunately, even through the mists of time, I remembered where to find the quest givers, and for the most part remembered where the quests were. The quest text was reasonably good about giving a cardinal direction in which to find you goal, but a lot of stuff was just generally west of the inn. Of course, one of the first places I had to visit west of the inn was the wendigo caves. As with the Defias in the vineyard and the kobolds in the mines, the wendigo are all clustered in groups outside of the cave, so getting just one is tricky, and at level getting two can lead to a quick demise. The cave itself is a curiosity, being something of a relic of the shotgun like approach to the design of early WoW. There is, as I recall, no real reason to go into the cave. The quest for wendigo pelts can be completed by hunting the mobs outside the entrance. But the cave itself is like a low level open world dungeon to explore. Because of aggro radius, it is dangerous solo, but quite manageable in a small group. 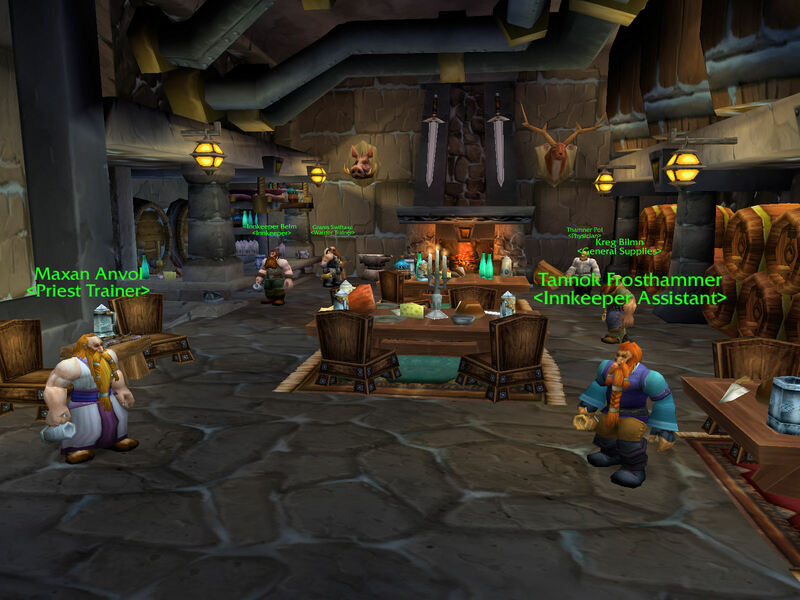 As the philosophy behind WoW got more focused, such areas stopped being put in, to the point when we hit Cataclysm and open world group content pretty much ceased to exist. I managed to miss the little camp setup by the cave where I had to pick up a case of shot for delivery. So while I remembered where I had to deliver the case, when I showed up I realized I did not have the item, so I had to run back and get it. The reward for the quest? Ranged ammo! Yes, from back in the day when ranged weapons had ammo, and there was vendor ammo and crafted ammo and some special reward variations of ammo, each of different quality and all of which impacted how much damage your weapon did. 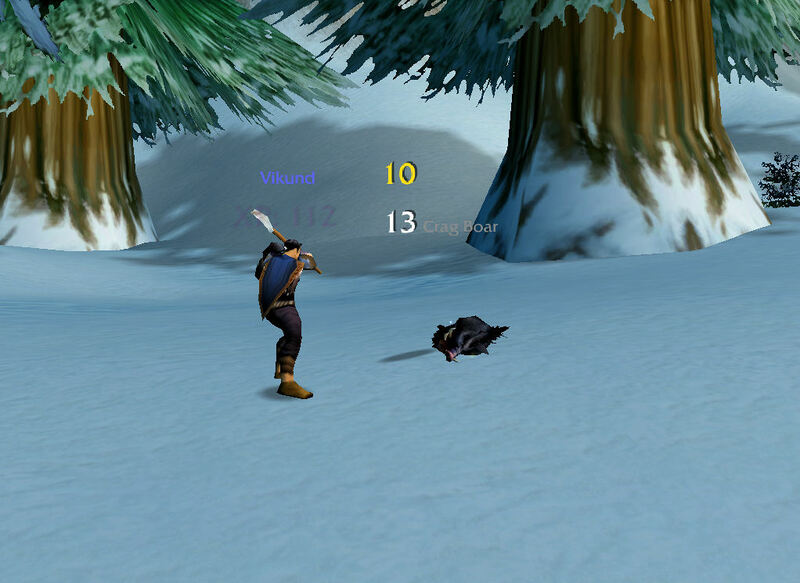 I also had one of several “kill boars” quests, which I did along the way. It was while doing this that I finally put my finger on another oddity about the server. The death animations are very abrupt. There is something not quite right. The actual animation isn’t missing, but it seems to run much faster than it should. Meanwhile, the combat wrap up isn’t quite right. As you can see, the XP floating text is faded while damage text is still coming up and the boar itself is already flattened out. It is a tiny and inconsequential detail as far as I can tell, but it is something that bugged me for a bit until I put it together. Anyway, I wrapped up the first round of quests, which sent me off west again, this time to the Brewnall Village on the ice covered lake. There I was asked to help out the locals with the usual bear/boar/snow leopard problem. Kill Kill Kill! Iceclaw bear, meet my shovel! I also took a moment to buy some armor upgrades. Equipment drops had been pitifully few and very low in quality. This is nothing like Diablo III or Torchlight II. And so vendor whites represented serious upgrades to my armor. 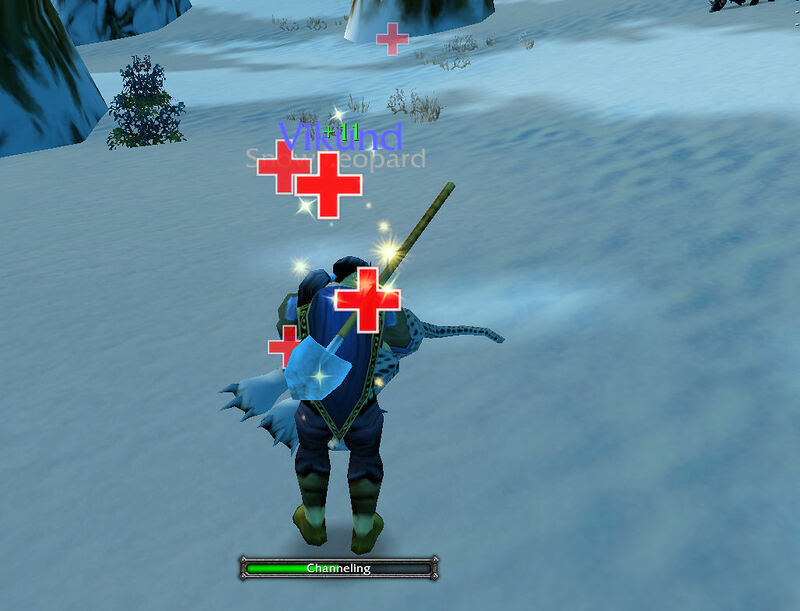 I also started making use of bandages between fights rather frequently, holding my mana in reserve for combat. Fortunately, I remembered to pick that skill up when I was in Stormwind. And I am seriously considering herbalism and alchemy for trade skills, just to get some more health potions. It is a dangerous world out there! After slaying some of the local fauna, I became involved in a convoluted scheme involving beer, beer substitution, and beer bribery… which I gather is pretty much the norm when dealing with dwarves in Azeroth. Once the first round of beer intrigue was turned in, I hit level 10. That was mostly thanks to having quite a bit of blue bar to start with along with gratuitous slaying of boars for cooking ingredients along the way. Of course, level 10 is a big level. With level 10 I got my first talent point. Oh, ancient talent tree, where should I spend my first point? How about in retribution? At that point I said farewell… for the time being… to the snowy sights in Kharanos. In another time, I own all of these! Then I recalled back to Goldshire and trained up my new skills. They included lay hands, so I have my big emergency self heal now. Unfortunately, I had been a bit too spendy with my cash. The vendor had an weapon upgrade for me… it was time to set aside my shovel… but I was out of coin. No new hammer for me yet! 2 more DPS means a lot to me! I decided, now that I was level 10 that I would put on my big boy pants and go take out Goldtooth, deep within Fargodeep mine. I figured that the kobolds in the area were levels 5-6, it ought to be no problem. So I fought my way in, survived the groups of two and three mobs… my aggro radius still seems kind of big… and made it all the way in to Goldtooth. I was at full health and full mana. He was only level 8 and only had one level 6 helper with him. It looked good. And then at 10% health, he turns and takes off down the mine, pulling in new kobolds to attack me along the way. I chased him and managed to kill and loot, but then I was in serious trouble. I used a potion. I laid hands. I used my pally bubble. And I ran for the entrance. I nearly got there. I died right at the mouth of the cave. But at least I was far enough out that I could run back as a ghost and safely revive, though I had to climb on top of the cave entrance to achieve that safety. A low level solo quest for which I was clearly over the suggested level, and I died. How times have changed. I think now Goldtooth is just sitting by himself outside of the cave. Meanwhile, I think I am going to have to grind kobolds for some cash. The shovel is clearly not cutting it anymore. This entry was posted in entertainment, World of Warcraft and tagged Emerald Dream, Kharanos, Nostalgia, Private Servers on October 16, 2012 by Wilhelm Arcturus. Really enjoying your report of your Emerald Dream adventures! My boyfriend and I played it for a while, but I guess that for us TBC was really the WoW Era, so we headed back for Archangel, the other server that the Feenix team is hosting, along with 3 more vanilla servers, including ED. You could maybe check that one out as well – tier 5 is soon to be released, and there are no raids like TK and Vashj anymore. Cheers and keep the posts coming, they never fail to bring a smile upon my face! Many’s the time I’ve wished for bandages in other games. 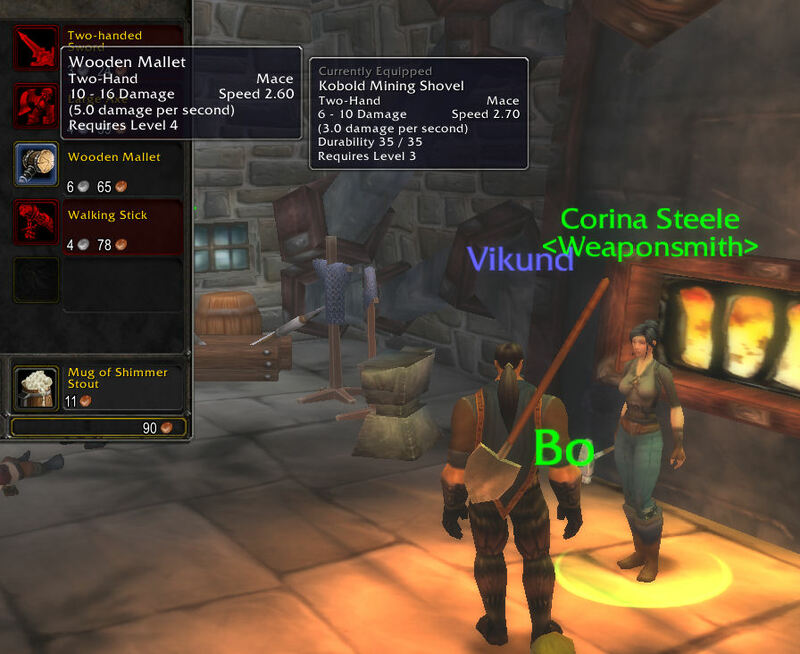 All of this Vanilla WoW talk has flipped my nostalgia bit. I started playing WoW at patch 1.12.1, rolled a paladin, and made the trek to Kharanos myself. That’s were I joined my first guild. I’m going to download this tonight. @Anjin – There is actually a 1.21.1 server called The Rebirth. I stumbled upon it after I started on Emerald Dream. It requires you have an original WoW install CD to start from. I am just not sure if I want to go back that far in time… and I threw my original WoW CDs away about a month ago. Go me! The Dwarven zones is where my route in WoW started as Darraxus is a Dwarf. 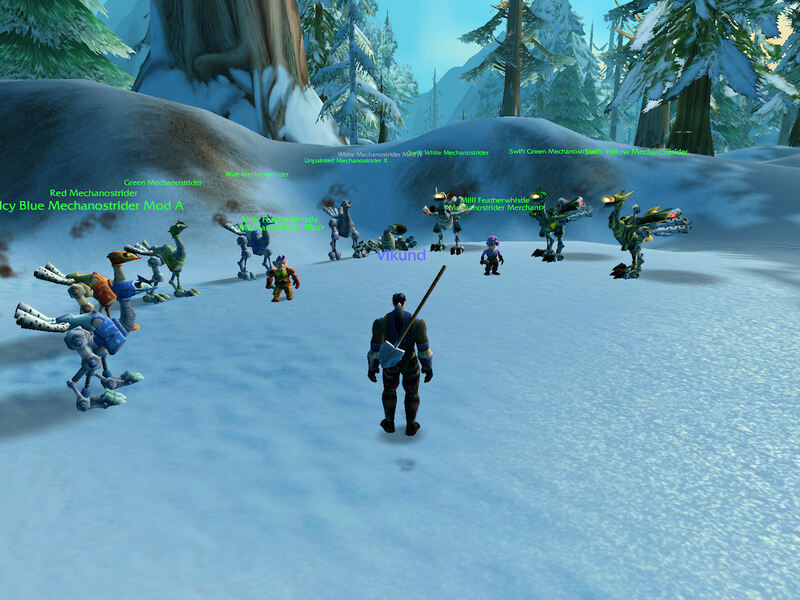 My fondest early memories were of Loch Modan. That is where I joined my first guild. We got free tabards and shot have fireworks at the edge of the Loch. It was an epic moment for me at that time. To be a noob again. 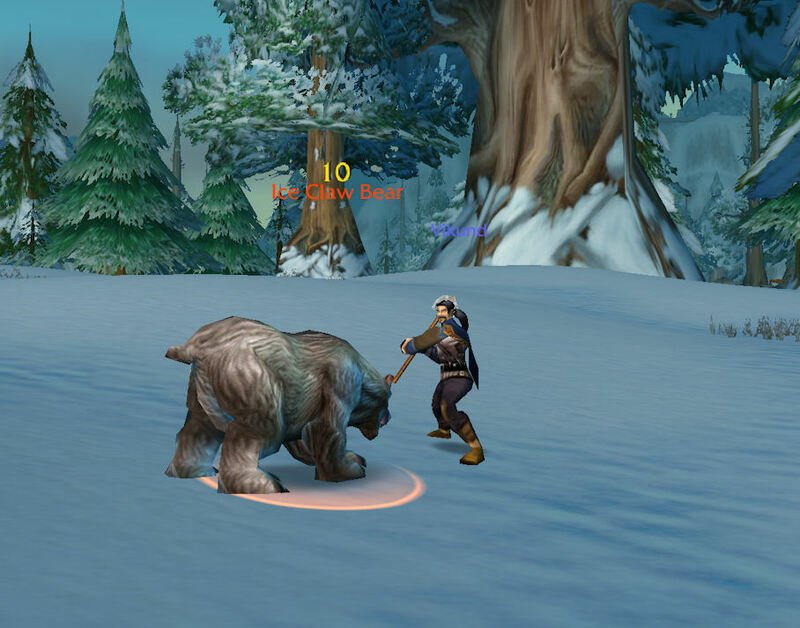 Regarding Kharanos…..those damn Yetis used to be terrible. I couldnt fight more than one mob at a time. Dont even get me started on the Murlocs in Elwynn. @Darraxus – Oh yeah, those murlocs are on my list, right after Jasperlode mine. I’ll happily trot to the logging camp up the road then get gobsmacked by multiple murloc adds. As I recall in my brief run through at the time, the murlocs were just as bad in Cata as they were back in the day. One thing left unchanged. 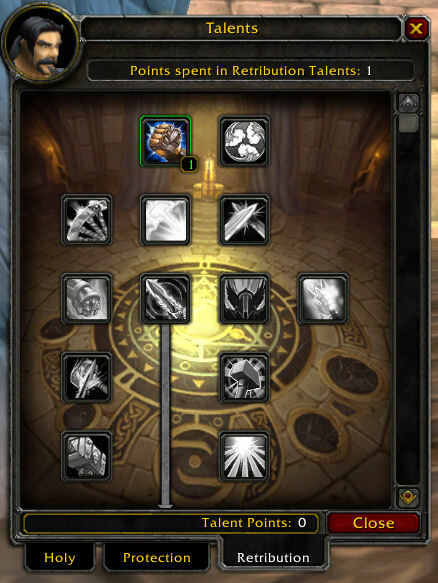 It is very possible that they are the same, but the last several characters I have leveled have not gotten that far into Elwynn before heading off to Westfall thanks to the boosted XP. In fact, I can not get close to finishing any zone before quests are already green. TheRebirth (and all other 1.12.x emus incl Valkyrie/ED/Molten/…) do not require CD installation. How you obtain a 1.12.1/.2 client is irrelevant, only that you have it to speak to the server. @Ahtchu – Well, I was comparing the relative instructions for the servers. For Emerald Dream, they send you directly to a torrent to d/l the right client. TheRebirth’s instructions tell you to start with an original CD. That you CAN get it from another source is always possible. But their instructions mention the CD and I am too lazy/paranoid to just download something at random that *might* be the right client. Some people will just stop right there if they don’t have the CD, which is as effective as requiring it. Yes I remember using bandages in vanilla a lot! Food was way too expensive. I have to say that I really hated the Dwarf starting zone back then. So much so that I deleted my character and rerolled human. Would be interesting to see how you do against Hogger and even the big pig (Princess?) at the farm in Elwynn Forest. Those two opponents were seriously tough back then: ‘lfg Hogger’ – those were the days! Ah lovely memory…I read your post yesterday, downloaded when I got home from work and got a’playing by evening time. Ahh to run my dwarven hunter from the dwarven starting zone to the elven starting zone to begin the efforts to grind elf rep like I did in the orginal vanilla was quite a reliving of experiances. The corpse hopping through the wetlands to M-Harbor to take the boat wasnt so bad last night…I only died 3 times on the way. In vanilla I had a Dwarf hunter with an elf mount. 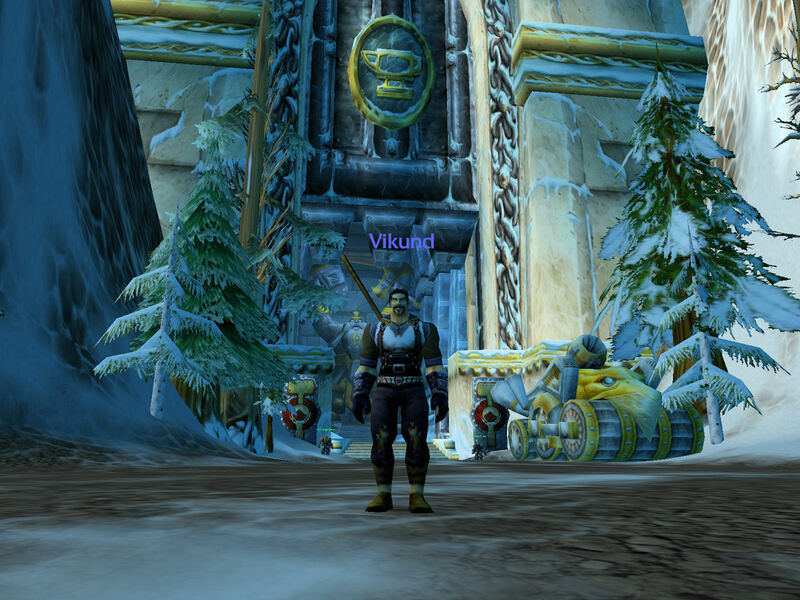 Starting my level grind doing all things elf…and what did wow do… it made everyone exulted with all of the alli factions through the Argent tern’y in WoLK. Everyone is running around with different mounts but back in the day…oh to have somthing different than your normal epic. @Wilhelm, hey man just letting you know that The Rebirth does link over to the correct place to download the client. The website is being redone because it’s a little confusing at the moment. The real setup instructions are stickied in the forums and contain the download link. Have fun & sorry for any confusion! If you run into any problems, during setup, check out the tech support forum. Most likely it’s been addressed before but if not, post ‘er up and someone will be in touch shortly.